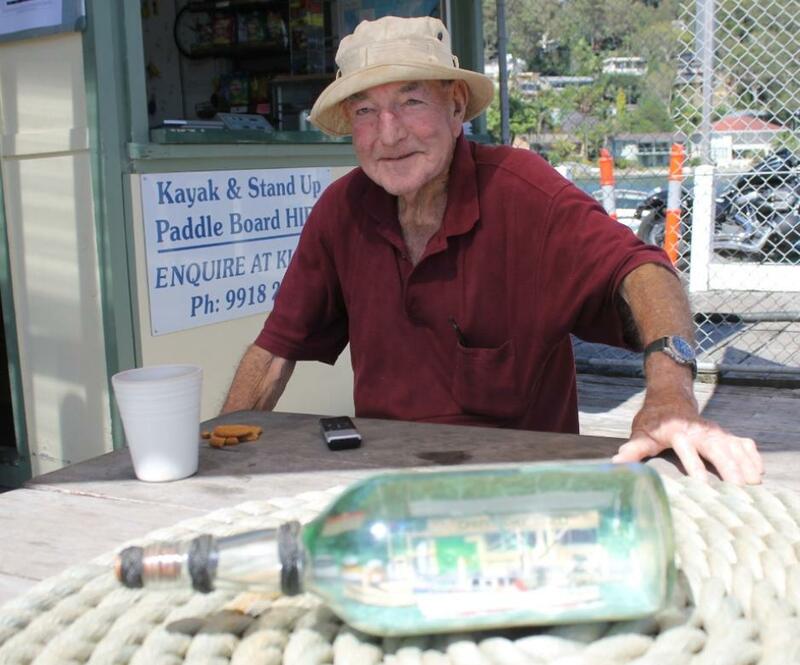 A love of the sea has filled the life of Merchant Seaman and Pittwater fisherman Ray Gascoigne. From early stories told by a Royal Navy man sent out here on the HMS Encounter for the 1913 commencement of our own RAN, to an apprenticeship at Cockatoo Island during WWII and decades as part of the Merchant Navy (the commercial vessels and crew that carry goods to and from overseas ports) and fishing here during his off months, Ray has seen a lot of ships and a lot of salt water. Today he builds ships in glass bottles – as shown in the short film below and cover of the Smith Journal. What is striking about Ray though is he is no weaver of ‘Fisherman’s Tales’ – when we asked him about a photograph showing a rather large shark he caught off Darwin, he states ‘it’s only about ten feet long’, which would make the gentleman standing beside it about a foot and a half tall. Twinkling eyes, with one eye on the waters of Careel Bay every morning, Mr. Gascoigne is the epitome of a saltwater gentleman. I was born at Linley Point on the Lane Cove River in 1928. I grew up there. They knocked our first house down for the new bridge – the Figtree Bridge. What can you remember of growing up? We used to come out to Palm Beach, a friend had a weekender at Sandy Point. I used to play rugby when I was about 20 with Hunter’s Hill Rugby Union Club until I went to sea, going to sea puts an end to that kind of thing. 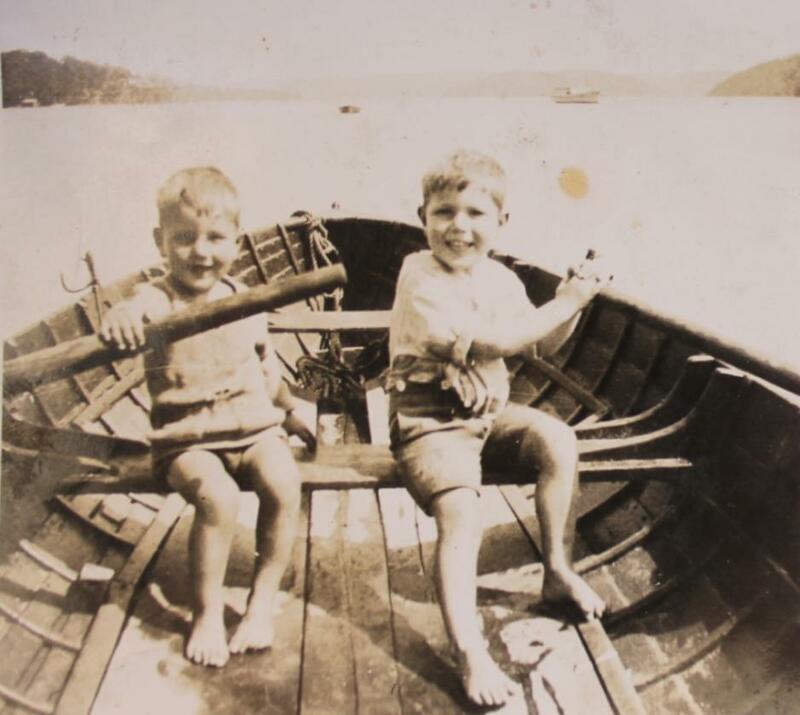 Ray (4 years) with brother Barry(18 months) – Barry also went to sea as an engineer. Ray and Barry and dog 'Mutt' with Cuneo children at home – Johnny Cuneo went on to be a great sailing man. You served an apprenticeship as a shipwright at Cockatoo Island – who trained you? The other shipwrights. This was 1943 – there were big projects there at this time as well as other ships that had been bombed or torpedoed coming in there to get repaired. This was all steel works. There was around two and half thousand of us there at that time and I served a five year apprenticeship. As soon as I came out of my time I went to sea. What did you think you learnt there? Not a lot – you don’t learn much when you’re a boy – I learnt the basics though. What ships were they building then though? Destroyers – we built a couple of those. Corvettes and a couple of Merchant ships – river boats they were called, ‘River Hunter’ was one. After the war was over they built a couple of little tugs over there, they were only small tugs, about 90 feet long, and they used all apprentice labour on those; that was good, we learnt a fair bit there. We had a couple of old Scotch shipwrights supervising us. There were a lot of Scottish people working there then you see, some of the old steel shipbuilders had come from the Clydebank – they were good shipbuilders, but we had just as good men here too, good Australian shipbuilders. Can you remember when the ferry was torpedoed in Sydney Harbour? Yes – we could hear it. I lived on the Lane Cover River at that stage. We had an old bloke who had been in the Royal Navy all his life staying with us and he immediately thought they were torpedoes. We could hear guns going off on the harbour. When he first joined they had sails on the ships, 1892 he started. His name was Chaloner Ebsworth; he worked for my old man, who was a builder, he was a painter when he came out of the Navy. He built a house alongside of us and when he got a bit old and feeble he sold the house and lived with us. He had a boat up here at Winnji Jimmi and would live on that half the year and the other half with us. He would tell us stories about how they used to chase pirates up in the Red Sea. He came out here on the Encounter when they formed the Australian Navy. He was ready to retire, had done his twenty odd years, when the First World War broke out. He stayed and they put him in the Australian Navy and he was in the Sydney when it sunk – he wasn’t in it when she sunk the Emden. My second cousin was though – he was a gunner in the Sydney when they sank the Emden. He got his eye knocked out, old 'Gunner' Gascoigne. He came back and was a fisheries inspector on the Hawkesbury. We used to think old Ebbsy was telling us stories, but he wasn’t, we found out later he was telling the truth. So you finished your apprenticeship in 1948 and then went to sea? I always wanted to go to sea, old Ebbsy probably filled our heads with stories. I first went to sea in 1949 – the first ship I went on was a little ship called the ‘Fiona’; she was about 3000 tons. I was with the CSR Company for fifteen years. They were a big company – they had mills in Fiji, a refinery in New Zealand. They used to refine the sugar for Australia in Sydney then. We used to take general cargo to Fiji and then would get molasses from over there, you couldn’t bring sugar back into Australia, so we’d bring back a light ship - a couple of thousand tons of molasses. We were going to North Queensland, Fiji, New Zealand. I was a long time with the CSR Company running to Fiji. Did you go through any cyclones? Yes. There were a few, which you get travelling in the Tropics, as well as Typhoons. Some of the storms in the Southern Ocean were bad too, especially down in the Great Australian Bight and further south of there. The strongest wind that I ever experienced was a hundred miles south of Noumea in ’62 or ’63; I was in a little ship called the ‘Rona II’ , that was the second Rona they had – I was in their first one too and she was built during the First World War would you believe! This is a sugar boat here on this Tambua – this is the Fijian word for a lucky charm – it’s on a whale's tooth, known as "the most powerful talisman in Fijian society". How long were you with the Merchant Marine? Well, I spent my life on the water. I have a Long Service Medal from the Merchant Marine – you got a medal after 15 years, Oak Leaves for the next 15 – I just missed out on getting the second set of Oak leaves which you receive for a further 15 years. I did a lot of trips up to Japan too. They flew me up there and I picked up a tanker called the ‘Esso Macquarie’, this was around 1964/65. While there I lived ashore at Yokohama for three weeks waiting for her. I went up there again on the MV Baron Murray, took coal up to Japan, and then on the Iron Sirius I did three or five trips on her to Japan with coal. These later ships were in the later 1970’s and 1980’s. My last big ship was 107 000 tons, the ‘Iron Sirius’ – this was 1987. What did you think of Japan? I loved it. I loved all the ships and all the seafaring that goes on up there, it’s part of their culture. I came ashore in around 1964 and built a home up on Bilgola Plateau. I married Wendy Shepley – she was a barmaid at Hunter’s Hill Hotel and we had two girls. I got into the fishing a bit then but would also go away to sea in big ships. In the latter years, for every day I was on a big ship I got .9 of a day off, so I’d do six months in a big ship and be home for five months. I’d go fishing then. When I had leave I’d be a lobster fisherman here – I also did prawns. We’d go outside, fish there too. I was working in a big trawler out here (Pittwater) for a quite a few years – she was called the ‘Lisa Ann’, a sixty footer. She’s been sold to Carmello Aeloe and works in Bass Strait now. Do you think there’s less fish in the estuary now as there was when you were first fishing here? Yes, there is less fish. I think it has to do with too much pollution up in the top of the river – with all those sewers running into the top of the Hawkesbury. There can still be a lot of fish and prawns there at times though, in the season. What were your favourite places to travel to? I loved Singapore – it was a lively nice place, good people when I was there during the ‘60’s and 70’s. We used to go to dock up there at Sembawang and the Mitsubishi dock in Jurong – we’d be there for two to three weeks. I liked Japan too. Which places didn’t you like? Port Headland, loading iron ore – it was hot and dusty and there was nothing there. What’s the best thing about spending a lifetime at sea? It’s a way of life. You know nothing else. What is one of your most memorable experiences during your career? I have a letter from General Westmoreland – he was running the Vietnam War. I took them out on Sydney Harbour – our Army, him and his entourage, they were having a day off. They used the charter boat Corsair that I was skipper of on the harbour. He sent me a letter from America with four stars on it, him and his wife, thanking me for the day out. How did you end up coming to Careel Bay boatshed? I was moored out here when fishing – prawn trawling and lobsters. I took a pleasure boat, the Osprey, to the Barrier Reef from here in 1964 – got Mobile fuel from here during those days. There was a Captain Hinchcliff in charge of the shed then. The shed was like what it is in the old photo – it has changed a little bit now, the paint colours are the same though. I still go there everyday, it’s historical, a proper boatshed. Here – Careel Bay Boatshed. I can come down and see old friends and have a coffee every morning. Enjoy what you’re working at. That’s the main thing. Huge thanks to the great people at Smith Journal for allowing us to reproduce their film and cover as part of Ray's page. Father – Builder – Herbert Frederick Gascoigne, born 1893, one of 11 children of Henry and Emma (nee Dickens) – enlisted at age 21 and served in AIF during WWI in Egypt and then in France. Returned in 1919. Married Phyllis Windrem in 1926. SMS Emden ("His Majesty's Ship Emden")[a] was the second and final member of the Dresden class of light cruisers built for the Imperial German Navy (Kaiserliche Marine). She was laid down at the Kaiserliche Werft(Imperial Dockyard) in Danzig in 1906, was launched in May 1908, and completed in July 1909. She had one sister ship, Dresden. Like the preceding Königsberg-class cruisers, Emden was armed with ten 10.5 cm (4.1 in) guns and two torpedo tubes. Emden spent the majority of her career overseas in the German East Asia Squadron, based in Tsingtao, China. In 1913, she came under the command of Karl von Müller, who would captain the ship during World War I. At the outbreak of hostilities, Emden captured a Russian steamer and converted her into the commerce raider Cormoran. Emden rejoined the East Asia Squadron, after which she was detached for independent raiding in the Indian Ocean. The cruiser spent nearly two months operating in the region, and captured nearly two dozen ships. In late October, Emden launched a surprise attack on Penang; in the resulting Battle of Penang, she sank the Russian cruiser Zhemchug and the French destroyer Mousquet. Müller then took Emden to raid the Cocos Islands, where he landed a contingent of sailors to destroy British facilities. There, Emden was attacked by the Australian cruiser HMAS Sydney. The more powerful Australian ship quickly inflicted serious damage and forced Müller to run his ship aground to prevent her from sinking. Out of a crew of 376, 133 were killed in the battle. Most of the survivors were taken prisoner, though the landing party, led byHellmuth von Mücke commandeered an old schooner and eventually returned to Germany. Emden's wreck was quickly destroyed by wave action, but was not broken up for scrap until the 1950s. The fourth warship of the name, Encounter was built at Devonport Dockyard for the Royal Navy and commissioned on 21 November 1905 under Captain C.F. Thursby, RN. A member of the Challengerclass, she was first rated as a second-class protected cruiser, having no side armour, but an inbuilt armoured deck. On New Year's Eve 1905 she sailed for the antipodes to join the Royal Navy's Australian Squadron and thereafter carried out the whole of her service to the east of Suez. Encounter's next six years of service were widespread, regularly visiting Australian and New Zealand ports and the Pacific islands, but for the most part were routine. 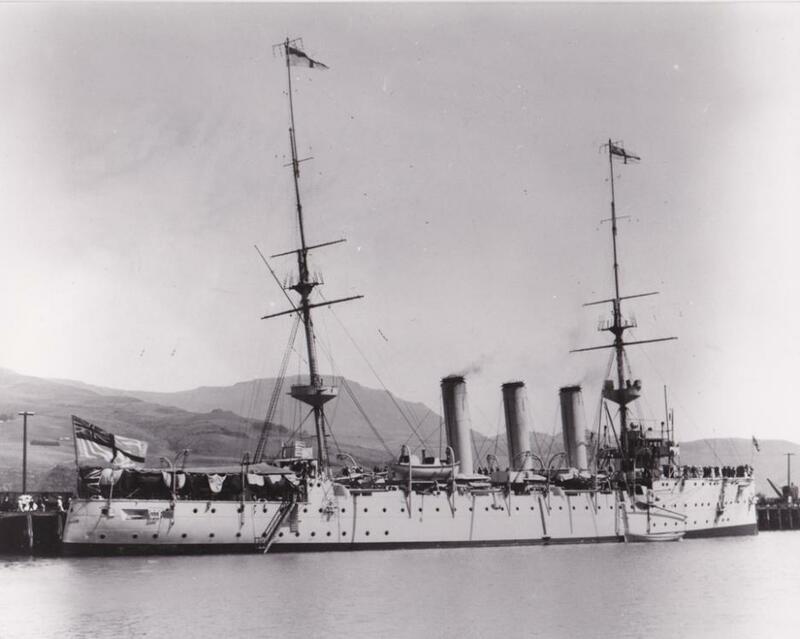 With the post-1909 expansion of the Australian Navy underway, Encounter was lent by the British Admiralty for use as a sea-going training ship pending completion of the new light cruiser HMASBrisbane. Volunteers were called for from the existing ship's company to form a nucleus crew, remaining for a further three years in the Australian Service and receiving Australian rates of pay. Nearly a third of the men decided to stay behind. Encounter was a popular ship, and it was only fit and proper, wrote one of those returning to England, 'that the "Encounter with her fine record, should become the foster-mother of the Royal Australian Navy'. Commissioned into the RAN on 1 July 1912, Encounter became Australia's first cruiser. Over the next two years she was actively employed in training the growing Navy and showing the flag at ports all around the nation. On 4 October 1913 she joined with the remainder of the new Australian Fleet Unit (comprising the battlecruiser Australia, light cruisers, Sydney and Melbourne, and destroyers, Parramatta, Yarra and Warrego) and took part in its initial entry into Port Jackson. In the days before the outbreak of World War I, Encounter was with the remainder of the Australian Fleet operating in Queensland waters. On receipt of the Admiralty warning order on 30 July 1914, Australia and Encounter returned to Sydney to replenish and complete repairs. War between the British Empire and Germany began on 5 August and the following day Encounter sailed from Sydney and headed north. On 12 August 1914 she intercepted and captured the steamer Zambezi, an ex-British vessel under German control, which became the RAN's first wartime prize. A month later Encounter accompanied the successful Australian operation to capture German New Guinea, escorting the transport and store ships and providing covering fire during the advance of theMilitary Expeditionary force from Herbertshöhe to Toma. These shots are generally regarded as the Navy's first offensive fire of the war. Encounter later took part in the search for the missing submarine AE1. Encounter became a permanent RAN unit in December 1919, but the active career of the 'Old Bus' was rapidly drawing to a close. On 10 January 1920 she briefly returned to her role as a sea-going training ship, making several trips to Melbourne and Hobart. On 28 May she took part in the RAN's first Fleet Review in Port Phillip Bay, which honoured the visit by His Royal Highness the Prince of Wales (later King Edward VII). Between June and August Encountervisited several ports in South Australia and Western Australia before returning to Sydney and paying off on 30 September 1920. The font in the Garden Island Chapel, Sydney, is made from timber recovered from HMAS Encounter. Ray’s father’s cousin was Thomas Basil GASCOIGNE who joined the Australian Navy in 1912, aged 21. As stated earlier, Tom was a gunner on HMAS Sydney and was wounded, losing an eye, in the Sydney’s victory over the German light cruiser Emden in the Indian Ocean in November 1914. When he returned home wounded in March 1915 he was given a hero’s welcome and presented with an illuminated address and a purse of sovereigns by the Wyong town leaders. Above: Ray and Barry on Pittwater - early days. Below: Ray at his favourite place - Careel Bay Boatshed.